Built in 1807 by John Harding, the historic Belle Meade Plantation developed into a 400-acre thoroughbred horse farm with its own train station, horse park, Greek-revival mansion, and housing for servants and former slaves. Today, Belle Meade Plantation includes 34 acres of its original property and several buildings, including the mansion and several outbuildings. It functions now as an educational resource dedicated to preserving Tennessee’s Victorian architecture, history, and equestrian lifestyle. Visitors can tour the buildings, shop, dine, taste wine, and enjoy special events held at this historic plantation. See their website at http://bellemeadeplantation.com/. The Belle Meade Plantation mansion began as a two-story Federal-style home, built in the 1820s with red bricks on a limestone foundation. On each side was a one-story wing. In the 1840’s, William Giles Harding made additions to the original home and updated the style to Greek-Revival. The mansion features three floors with ceiling heights of fourteen feet on the lower two floors and eight feet on the top floor. It also contains a central hallway that extends through the three levels and a circular, cantilevered staircase with empire style spirals carved from cherry wood. Throughout the home are palladium wall niches for holding lamps at night. The home contains bedrooms for family members and guests as well as servants’ quarters. The limestone foundation at Belle Meade Mansion was having issues common with many older homes. It was sinking into the soil beneath it. After many years, rainwater had caused hydrostatic (water) pressure, creating cracks and water seepage in the walls and floor of the foundation. Heavy rains also caused water to seep beneath the foundation, and continued freezing and thawing had caused the soil to expand and contract, creating sinking and voids in the ground beneath the structure. Because of the sinking and leaning walls in the foundation, it could no longer provide adequate support to the structure about it. Signs of foundation failure included sloping and uneven floors in many rooms of the old mansion. Because of the age and historic value of the building, the preservers of the property knew they couldn’t hire just anyone to restore the 200-year-old foundation without damaging the above structure. 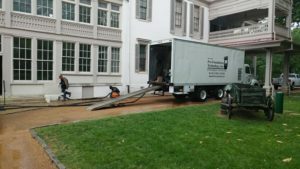 Because of their reputation for doing outstanding foundation repair, including work on prior historic buildings, the management of Belle Meade Plantation did not hesitate to contact Pro Foundation Technology (PFT) and their division, Polyjacking.com, from Kansas City. PFT and Polyjacking.com have more than 30 years of experience doing waterproofing, concrete, and foundation repair in Kansas City and throughout the Kansas and Missouri area. They use the highest-quality products from US manufacturer, Earth Contact Products (ECP) and have won recent recognition from HomeAdvisor for their quality service and workmanship. Not only were they able to lift and level the foundation without messy external excavation, but they also caused minimal disruption to the operations at the plantation and caused no additional damage to the structure or its contents. Belle Meade Mansion is restored to its former glory, is supported by a stronger foundation, is more structurally sound than ever, and will last for many years to come. No matter if your home is over 200 years old or less than 20 years old, Polyjacking.com can lift and restore its foundation both quickly and cost-effectively so that it is better than new. Contact Polyjacking.com today! It is very common for homes to develop foundation issues at some point in their life. Right after construction, all homes have some degree of natural settling. Eventually, water leaks, changes in soil, hydrostatic pressure, and many other factors contribute to foundation problems. Following is a list of the top 8 warning signs that a home or business has foundation problems. Contact Polyjacking.com if you see any of these warning signs. If the basement floor is wet or the basement walls are leaking water, it is important to address the cracks. 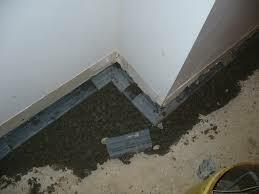 Sometimes these leaks are a sign of more serious problems to the foundation of the structure. Over time, the soil beneath the foundation may settle and cause the foundation itself to sink or shift. Too much change may lead to severe cracks, water damage, and foundation failure. 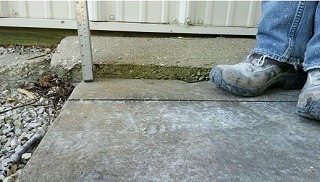 If the floors in the basement or inside the building are uneven, it is a sure sign there are foundation problems. It is likely that some portion of the foundation floor has sunk deeper into the soil or that a foundation wall is leaning or bowing. These are both serious issues that require foundation repair. 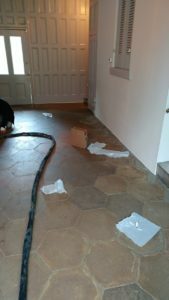 It is not uncommon for floors to develop small cracks shortly after construction due to natural settling. 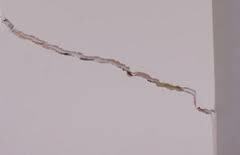 Cracks which continue to expand or leak water should be addressed as soon as possible. 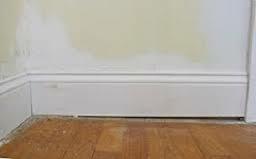 Some cracks can be filled before they develop too much water damage. If cracks are due to shifting of the soil underneath the foundation, the concrete slab may require additional lifting or leveling. 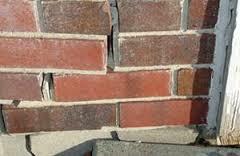 Most buildings will develop small cracks in the walls after construction due to natural settling. If cracks continue to become larger or leak, they should be filled before further problems develop. If cracks are horizontal, stair-stepping, or widening quickly, it may be a sign that the foundation needs to be repaired or replaced. Some soils, especially clay soils, have a tendency to expand and contract depending upon moisture content. If foundation walls are leaning, bowing or bulging, that is a sure sign that there is too much hydrostatic pressure from the exterior soil. This is a certain sign that the foundation needs some sort of reinforcement before it fails. When doors and windows don’t open or close properly, it is usually due to a shift in the frame and surrounding wall or floor. 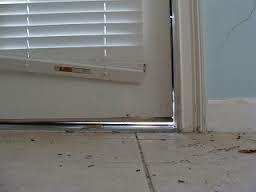 Usually, you will find that there are cracks in the caulking area around the frame that may get wider or spread. This is a certain sign that the foundation is settling or sinking unevenly and should be repaired before it gets worse. 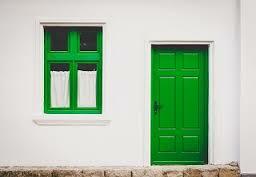 Gaps around doors, windows, and garage doors also indicate foundation issues. They are caused when the foundation floor begins to sink or become uneven or when the walls themselves begin to lean or rotate. Besides the fact that you don’t want cold or hot air leaking through gaps, it is an indicator that the foundation should be checked and repaired. When your outside chimney is leaning, that i s a certain sign of a foundation problem. Most likely the soil beneath the chimney is not supporting the chimney uniformly causing it to lean. This indicates that the foundation beneath the chimney needs additional support or repair. What if you have warning signs? If you have one or more of the above warning signs of foundation problems, it is important that you contact a foundation repair specialist immediately. Many of these problems are caused by a settling or sinking foundation. Polyjacking.com is the area specialist in lifting and leveling concrete foundations. Contact us for a free consultation and estimate for repair of your problem foundation. If you’re looking for a professional foundation repair company built on honesty, quality, and customer satisfaction, you’ve come to the right place! At Pro Foundation Technology, Inc., we care about our customers’ needs and concerns. We make sure the job is done right the first time, giving you peace of mind for many years to come. Pro Foundation Technology, Inc., the parent company of Polyjacking.com, is a family owned and operated foundation repair company that has been serving the Missouri and Kansas area since 1978. Dennis Morgan is the owner of Pro Foundation Technology, Inc. and the father of Joe Morgan, who owns Polyjacking.com. Both Joe and Dennis, as well as their employees, have the skills and experience to provide the best service for residents in their service area. This is why Pro Foundation Technology, Inc. is a long-standing member of the BBB with an A+ rating and a preferred contractor on Angie’s List. Both companies are licensed, as well as insured, and offer financing options for customers. 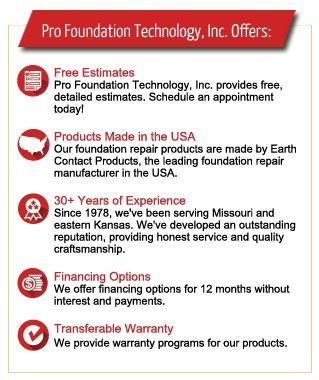 Why is Pro Foundation Technology, Inc. the Leading Foundation Repair Company in the Kansas City Area? How can Pro Foundation Technology, Inc benefit you? First, Pro Foundation Technology uses foundation repair products by ECP that are made right here in the USA. Second, we provide free, detailed estimates so we can inspect your property and look for the source of foundation damage. If you have foundation issues, we use the latest piers on the market to restore your foundation back to normal. However, our services are not just limited to residential projects, we also serve commercial and municipal applications. We use steel push piers, helical piers, and helical tiebacks to stabilize foundations. We keep basements safe and dry with waterproofing solutions, such as interior/exterior waterproofing, sump pumps, French drain systems, and crawl space encapsulation. 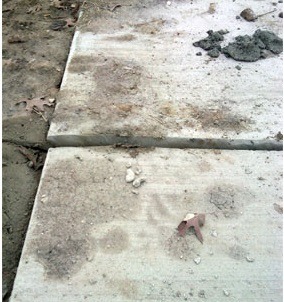 To stabilize a sinking concrete slab, we use high-density polyurethane foam to lift sidewalks, driveways, and more. Compared to concrete replacement, concrete leveling is the most cost-effective and non-invasive alternative to providing a safe, sturdy surface. In addition to saving money, there is little downtime because your concrete will be ready to use within minutes after repairs are made. If your crawl space is suffering from moisture or water damage, we offer crawl space encapsulation and piers to eliminate further damage. If you’re looking for quality craftsmanship from professionals, contact Pro Foundation Technology, Inc. or Polyjacking.com today. All of our work includes a “no hassle” transferable warranty. Read our testimonials to get a reference list of satisfied customers. What is Polyjacking and Why is it Beneficial? At Polyjacking.com, we use poly equipment and trucks to lift the concrete slab. Polyjacking is a process that requires raising the concrete slab by drilling holes through the top surface of the affected slab, then injecting high-density polyurethane foam into the holes to fill in voids and cracks. Smaller holes: With polyurethane foam, we can drill smaller holes (5/8″) into the concrete than other methods. Mudjacking requires larger holes (2-3″). Lightweight material: Since polyurethane foam is lightweight compared to the mudjacking slurry, it doesn’t create pressure to underlying soils. The slurry used for mudjacking is heavy, causing resettlement over time. Fewer holes: Polyurethane foam requires fewer holes which makes your concrete surface look cleaner afterward compared to traditional mudjacking. Permanent repair: Polyjacking is a long-lasting repair method, not a temporary fix. It won’t lose density or erode like mudjacking. It cures within minutes, allowing you to use the concrete surface shortly after installation. What Kind of Concrete Surfaces may Require Polyjacking? Polyjacking can be applied to sidewalks, driveways, walkways, parking lots, patios, steps, garage floors, and basement floors. Not only do we offer residential repair service, we also provide commercial and industrial service to repair office floors, warehouses, sports arenas, libraries, and much more. Why Choose Polyjacking Over Other Concrete Repair Methods? Why Should You Choose Polyjacking.com for Polyjacking Concrete Repair? We offer free online quotes for every project in our service area. Our service area includes Arkansas, Colorado, Illinois, Iowa, Kansas, Kentucky, Minnesota, Mississippi, Missouri, Nebraska, Oklahoma, Tennessee, and Texas. We provide residential service for Kansas and Missouri only. Polyjacking is an important concrete repair service for many residents of Kansas City and St. Louis, MO. This service is used to lift and stabilize sinking concrete slabs. Sinking slabs are usually due to variations in temperatures and moisture content in the soil around the slab. Polyjacking is the most effective way to fix this issue, as it supports the foundation from underneath while compacting and stabilizing the soil. This results in a more stable foundation or slab and also helps to seal cracks in the concrete. Polyjacking.com, the Polyjacking branch of Pro Foundation Technology (PFT), can help restore your settling concrete slab immediately. Settling concrete slabs are usually the result of voids and spaces forming beneath the slab. This can happen when the soil shrinks due to extremely dry, hot weather, or when frost in the ground freezes and thaws. Hydrostatic pressure is caused by excessive moisture absorbed by the soil. It pushes against the slab, causing it to shift and crack. Varying moisture content in the soil also leads to the formation of gaps and spaces in the soil under the foundation. These gaps cannot provide the adequate support for the concrete, causing the slab to sink and settle into these voids as a result. By using polyjacking to fill these voids, we can raise the slab to the proper position. Cold temperatures can cause the foundation to heave and settle, requiring support from slab jacking underneath. Dry conditions can lead to soil shrinkage, forming voids that must be filled by polyjacking services. Whatever the seasonal issue is in your home, we can help give you the necessary repairs to ensure that your slab is well stabilized and protected from seasonal damage. First, holes are drilled through the slab in a strategic pattern to maximize lift and minimize loss of structural integrity. 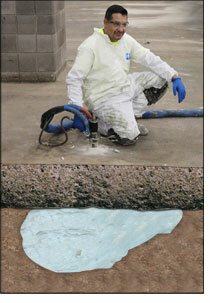 Next, the high-density polyurethane foam is injected through the slabs to fill voids under the concrete. This polyurethane material expands to fill voids and compact the soil around the voids, creating a more stable foundation for the concrete slab. 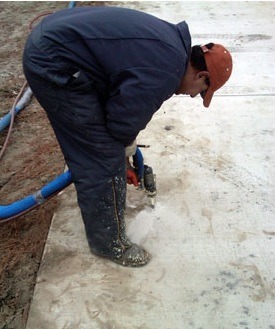 Once the slab is raised, any remaining cracks can be filled, as well as the holes that were drilled previously. 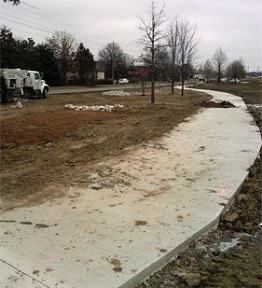 The equipment is removed from the job site and the slab is back to normal and ready for regular use. This polyjacking procedure can prevent seasonal foundation problems in your home or commercial structure. Polyjacking is a versatile service that can be used in nearly any type of weather to prevent all sorts of seasonal issues. Contact us today for more information. Polyjacking is a permanent solution for settling industrial concrete floors. This method of concrete repair in the industrial setting injects polyurethane foam into a 5/8″ hole that is drilled through the damaged concrete. This polyurethane foam fills the voids beneath the concrete and lifts it back to its original level. Because of the quick drying time, the concrete is ready for use in about 15 minutes. Concrete can move and shift due to the changing soil moisture beneath it. When the soil gets too wet, it tends to heave and when it is too dry, it shrinks. This shifting and shrinking of the soil cause voids beneath the concrete. This causes the concrete to settle into these voids. Polyurethane foam injected into these voids lifts and stabilizes the concrete back to its original level. When an industry relies on production for their profit, you don’t want to have any downtime. That is why when there is a need for concrete repair, the best choice is polyjacking. There won’t be a long stretch of downtime and your concrete will be ready for use right after repairs are made. The curing time of the polyurethane foam is around 15 minutes. Polyjacking is less expensive and much faster than concrete replacement. It has a lifting capability of 900 tons so the process can be completed without having to move machinery or shelving before the repairs begin. Why Polyjacking for Industrial Concrete Repair? The process of polyjacking allows for precise control of the lifting process to within 1/10th of an inch. There is no shrinkage of the material over time. Once the machinery, work tables, and shelving are leveled, they will stay that way for years to come. Some of the structures that benefit from polyjacking are apartment buildings, shopping malls, sports arenas, concert halls, skyscrapers, theatres, airports, factories, and amphitheaters. If your industry facility is in need of concrete repair, let the experts at Polyjacking.com give you a free inspection.